Kiger Mustangs…intelligent, beautiful, versatile athletes…are considered “living genetic treasures” that embody the very essence of what it means to be called a horse. 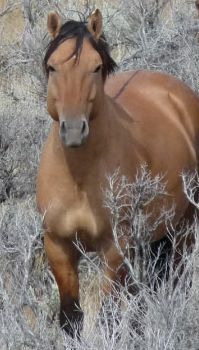 The Kiger Mustang is uniquely different from any other horse found in North America. Most wild mustangs are of mixed bloodlines and exhibit a wide variety of colors and body styles. 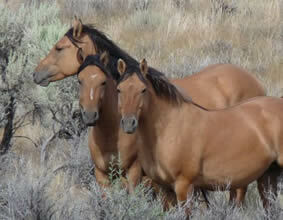 However the wild Kiger Mustangs possess many characteristics of the original Spanish Mustang. When the Spaniards set out to conquer the New World in the early 1600’s, they brought with them their horses. These carefully bred descendents of the early Iberian horse had carried many a warrior into battle and proved themselves as sturdy, sure-footed and intelligent mounts. For thousands of years, the horses of the Iberian Peninsula have been considered the ideal "essence" of what a horse should be. Throughout European history the Iberian horse was praised as the finest horse of war by the Romans and Greeks and known for its uncanny agility, courage, presence, tractability and beauty. When these conquering steeds of European history stepped foot on to the New World soil, it wasn’t long before they were duly noted by Native Americans as an essential must-have! The influence of the ridden horse spread rapidly throughout southwestern lands. American settlers and Indians alike rapidly mounted themselves on these sturdy war horses to wage war for the land they claimed as their own. It just might be that the conquering Spanish were defeated with the very animal they themselves brought to accomplish that job! 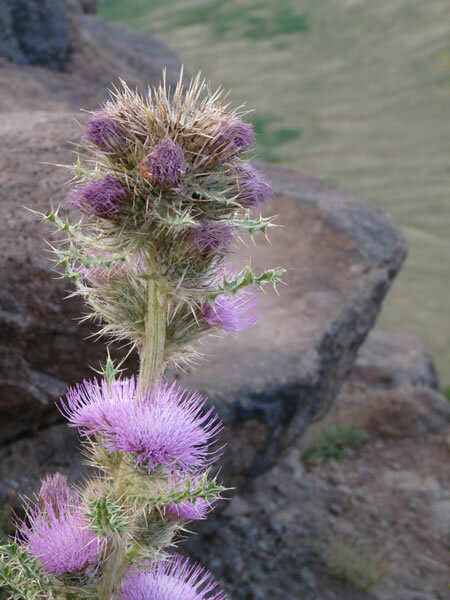 The American cowboy and rancher used the descendents of this original Spanish import to work the land, carry them miles across the vast west and round up and drive the cattle that they raised. Escaped horses became the basis for the wild mustang herds. The word mustang was derived from the word mesteno, which meant “unclaimed sheep" in the Spanish language and later came to mean "wild" or "unclaimed" horse. Mustang came about as an English language slang term for mesteno. of “improving” the horses that they rode and started cross breeding new bloodlines into the original Spanish line. The basis for today’s quarter horse came from crossing what was known as Little Steeldust mares (descended from the original Spanish horses) with back East stallions carrying English Godolphin Arabian blood. The wild mustang herds became increasing diluted in their bloodlines and it was thought that by the early 1900’s, the original pure Spanish bloodline was pretty much extinct on the open range. 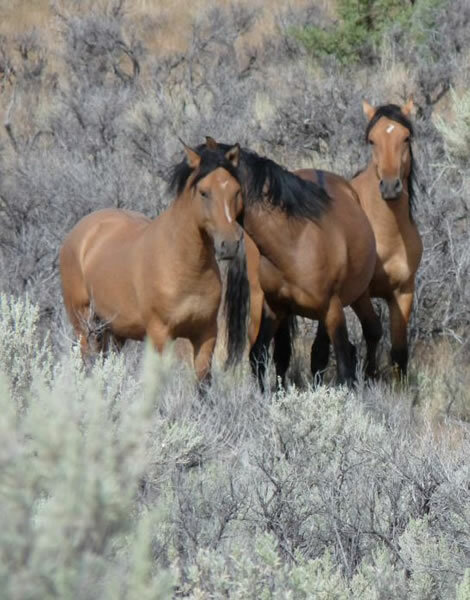 Imagine the surprise and delight of Ron Harding, a BLM wild horse specialist, when in 1971 he discovered a small band of horses that were to become known as the Kiger Mustangs. 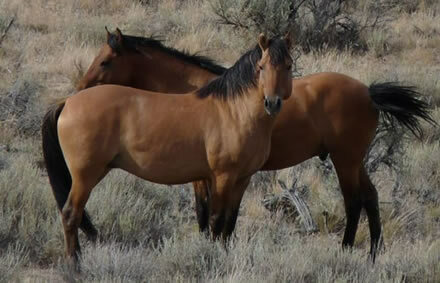 By Beatty’s Butte, near the rugged Kiger Gorge, Harding had found a herd of 27 homogenous marked horses; all had similar color, conformation and distinct markings known as the dun factor. It was decided to separate these special horses and have genetic testing performed at the University of Kentucky to determine their heritage. The DNA testing showed a high level of Spanish markers linking these “Kigers” to the Spanish explorer’s horses of the 1600’s which also carried the primitive gene for the dun factor. The color of horses carrying the dun factor varies from dun and red dun to grulla (mouse gray), buckskin, and variations of these colors. Distinct markings on horses with the dun factor are most prominently seen in a dark dorsal stripe running down the middle of the back and into the tail. Other markings include zebra stripes on the knees and hocks; chest, rib and arm bars; outlined ears; the top one-third of the ear on its backside darker that the body color; fawn coloring on the inside of the ears; a bi-colored mane and tail; face masks and cob-webbing on the face. The less white these horses have, the stronger the dun factor. An individual horse having the dun factor may have many but not all of these markings. Kiger Mustangs have the physical conformation of both the tarpan and oriental hotblood horses from which the original Spanish Mustangs came. They have small, round bones, small feet and very little feather on their legs and fetlocks. Their eyes are big, wide set and prominent. Kigers also have distinctly hooked ear tips and fine muzzles. Temperament wise, the Kigers are very intelligent, learn extremely fast and are noted for stamina and toughness both in modern day and Spanish legend. 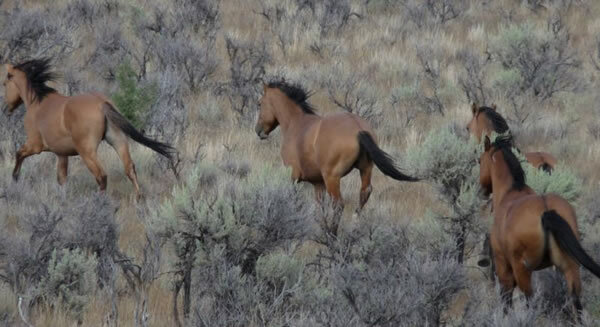 To preserve this unique and rare bloodline, it was decided that this small herd of original Kigers would be separated from other mustangs and the BLM placed two groups in different fenced Horse Management Areas (HMAs). 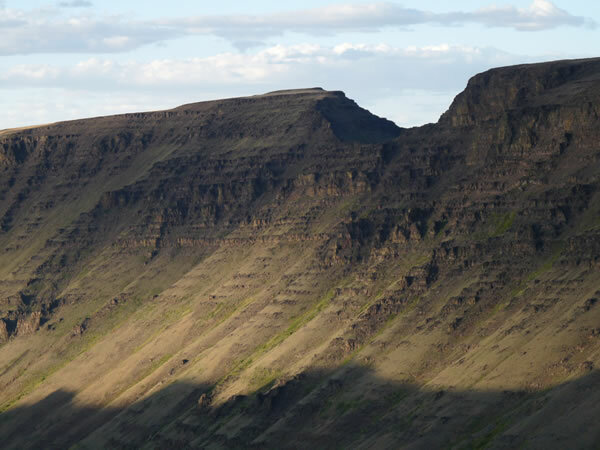 Seven horses were placed in the Riddle Mountain HMA and twenty in the Kiger HMA. Two herds were established in case an unforeseen natural disaster wiped out one herd. 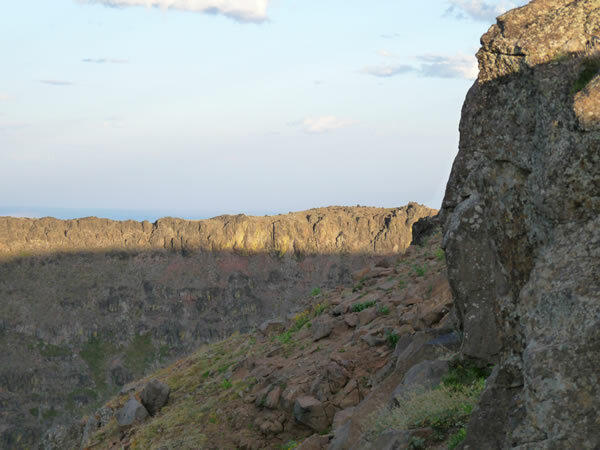 The Kiger Horse Management Area (HMA) covers nearly 37,000 acres with a Kiger herd population established at a minimum of 51 and a max of 82 horses. 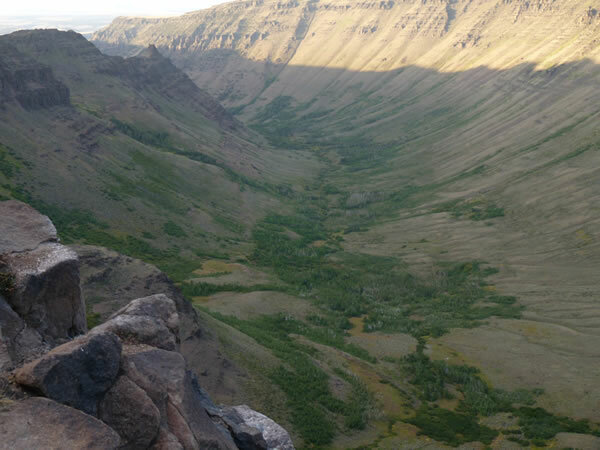 The Riddle Mountain HMA contains nearly 28,000 acres and the horse population is managed to range between 33 and 56 head. Only about 200 Kigers are left in their original wild environment. 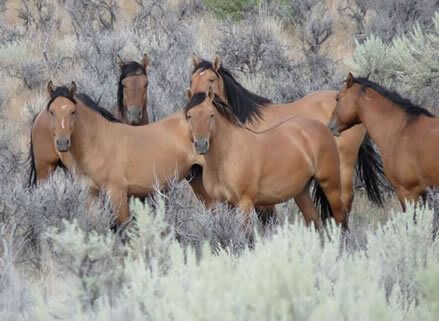 Every four years when the herds reach their maximum population, the extra horses are rounded up and taken to the Burns, Oregon Wild Horse Corrals where they are made available for adoption to the public. At the 2007 adoption the top selling horse was a 2 year old golden dun stud which sold for $7800.00, while the top mare a dark Grulla brought $7400.00. 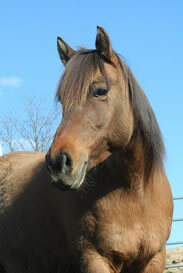 At the 2003 Kiger Adoption the top selling horse was a young filly which sold for $19,000.00. The better the conformational quality, the higher the bidding goes! In today’s world Kiger Mustangs are an established, recognized breed. Part of a larger group of “Colonial Spanish Horses” they are recognized by the American Livestock Breeds Conservancy. 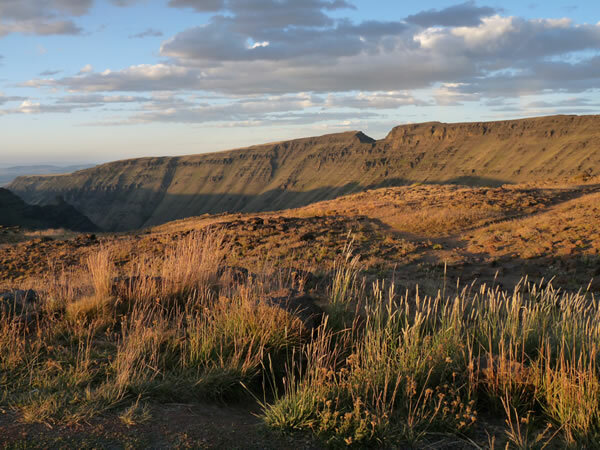 Several Kiger registries have also formed with the most popular being the Steens Mountain Kiger Registry, the Kiger Mesteno Association and the Kiger Horse Association & Registry. The Kiger Mustang is truly a versatile athlete that can be found in western pleasure arenas, dressage competitions and trail classes or simply out on the range bringing in the cows. From driving, performance and pleasure to endurance and cutting….the Kiger Mustang can do it all.